Bodleian Library. MS. Eng. Poet. e. 1. XV Cent. Source: Edith Rickert, Ancient English Christmas Carols: 1400-1700 (London: Chatto & Windus, 1914), p. 245. This is the salutation of the angel Gabriel." "(cf. Part I, p. 35: Nowell, nowell, nowell, nowell) and the note: "This is the tune for the song following; if so be that ye will have another tune, it may be at your pleasure, for I have set all the song." "There are several copies of the following. Chappell has one, (see his valuable Collection, ii, 53), and he says there is one in the British Museum, at least two hundred years old: there is also one in D'Urfey's Pills, vol. iii, 247-9, and in Roxburghe Ballads, British Museum, ii, 257. Also found in A. H. Bullen, A Christmas Garland (London: John C. Nimmo, 1885), pp. 187-8, with the note: "From Wright's Songs and Carols (Percy Society). An inferior version (from MS. Harl. 541) was printed by Ritson." Editor's Note. Concerning Bullen's note, see the excerpt from Ritson at the bottom of Bryng Us In No Browne Bred (link opens in a new window). "The editor of the MS. (Mr. T. Wright) observes that “The great variations in the different copies of the same song, show that they were taken down from oral recitation, and had often been preserved by memory among minstrels, who were not unskilful at composing, and who were not only in the habit of, voluntarily or involuntarily, modifying the songs as they passed through their hands, and adding or omitting stanzas, but of making up new songs by stringing together phrases and lines, and even whole stanzas from the different compositions which were imprinted on their memories.” But what renders the manuscript peculiarly interesting, is, that it contains the melodies of some of the songs as well as the words. From this it appears that the same tune was used for different words. 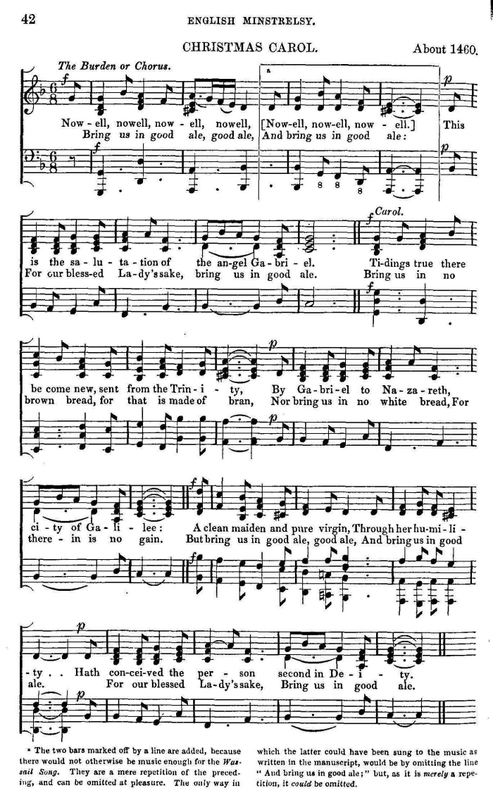 At page 62 is a note, which in modern spelling is as follows: “This is the tune for the song following; if so be that ye will have another tune, it may be at your pleasure, for I have set all the song.” The words of the carol, “Nowell, Nowell,” (Noel) are written under the notes, but the wassail song that follows, and for which the tune was also intended, is of a very opposite character, “Bryng us in good ale.” I have printed the first verse of each under the tune, but it requires to be sung more quickly for the wassail song than for the carol." He also notes: "An inferior copy of this song, without music, is in Harl. M.S., No. 541, from which it has been printed in Ritson's Ancient Songs, p. xxxiv. and xxxv." Again, see the excerpt from Ritson at the bottom of Bryng Us In No Browne Bred (link opens in a new window). Also found in Henry Vizetelly, Christmas With The Poets (London: David Bogue, 1851), who notes that "Good ale, however, like most other things when taken in excess, is attended by certain inconveniences, as the following song, who forms an appropriate moral to the two preceding ones [this and A Bone, God Wot! ], will serve to explain:" Ale Makes Many A Man To Stick At A Brier.